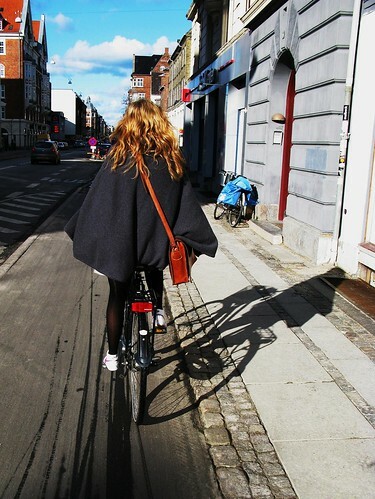 Looks like the cape is still going strong on the ladies of Copenhagen. It's been a classy addition to the streetstyle scene this winter. 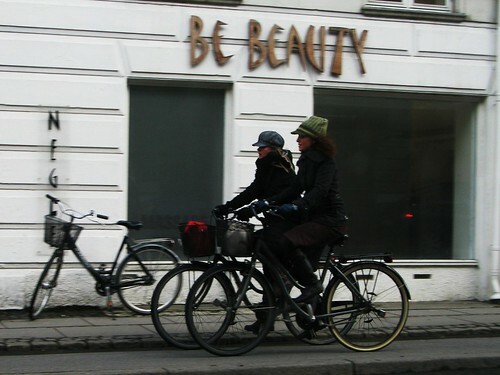 Another pair of Copenhageners being socialable as they ride from A to B. Found this on the Telegraph's website: Goodbye Lyrca, hello street cred. Great title. "More and more people are choosing to cycle to work, but what do you wear if you have an aversion to Lycra and road racing? Paula Cocozza offers some suggestions for the fashion-conscious cyclist..."
It's an amusing satirical piece but with many a vein of cycle chic truth. "The fallacy at the root of all helmet design is that people who ride a bike are cyclists. We're not. We just want to look like ordinary folk who happen to have chosen the bicycle as our mode of transport." "A humble adornment, but, according to Boris Johnson in response to our inquiry, it's the single most important accessory to cycling. Over to Boris: "When you're cycling and you want to stop talking quickly because you're about to hit the car in front, you need to put your mobile phone smoothly away in a fluid action, to ease from the breast pocket to the handlebars in one swift parabola of the wrist." How come there are so many skid marks on the cycle path (top picture)? Is that a danger spot? Anonymous, I think the lines in the first picture are because it snowed the other day there, and those are probably salt deposits and whatnot (at least that's what they look like to my untrained eye). The Telegraph article is interesting but I think draws the wrong conclusion. People aren't taking to cycling because it's suddenly fashionable - popular yes, but not fashionable. Furthermore it isn't the lack of designer kit that's hampering them it's the insistence of bike shops and "real cyclists" that you need to wear lycra before turning a pedal. Unfortunately the UK commuting scene hasn't evolved to accept "normal" clothes can be worn on a bike. I don't think those are skid marks, more like water streaks; caused by cyclists riding thru a puddle and the tires carry the water forward onto dry pavement for a bit. I'm sorry but the Chanel bike is ugly. And I think Zak has proven that cycling can be VERY fashionable. 2whls3spd wins the prize. It's just water marks from a puddle. I don't think I've ever seen skidmarks on bike lanes if I think about it. The Telegraph article is merely one of many lately that try to tell us cycling is trendy, even though we've all been doing it for years and generations. Ha Ha, you made my day, dear blogger.